The selection of wood for felling was an important process. Timber boards had to be cut from straight trunks of good quality which had sufficient heartwood with few defects. 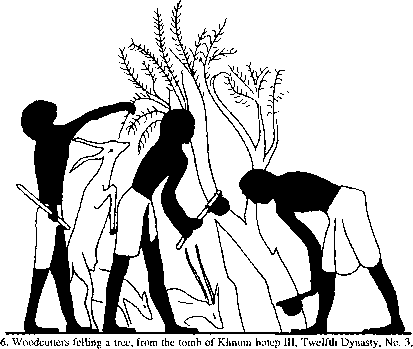 A fine illustration showing woodcutters felling a tree and feeding its foliage to three gazelles is seen in the Twelfth Dynasty tomb of Khnum-hotep III at Beni Hasan (figure 6). These men are using bronze axes which have a curved cutting edge with integral projecting side lugs. The blade fitted into a groove cut into the head of the ash shaft. Wet leather thongs were bound around the lugs and shaft and as they dried they pulled and tightened the assembly together. brought to the courtyard of the carpenters' workshop. Set into the ground in the centre of the courtyard there would have been a sawing post, to which the log was lashed with cord. A carpenter would use a pullsaw to rip down the green timber. As the saw cut down the log, the lashings had to be adjusted (figure 7). Often a wedge or lever mechanism which operated with the aid of a heavy weight, perhaps a stone, was pushed into the top of the saw cut. This would help the saw to move freely through the wet timber. Ripping down timber by these methods is well illustrated throughout the Dynastic Period. We have no evidence to suggest that sawpits were used by Egyptian carpenters. Trunks were always converted into boards by the 'through and through' process (figure 8). This minimised the amount of wastage but boards converted by this process were liable to cup, owing to tangential shrinkage (figure 9). The exposed slash-grain which results from using this conversion process (figures 7 and 10) can be seen when examining the timber. The cupping of timber caused by tangential shrinkage of boards cut by 'through and through' conversion. Timber must be seasoned to make it easier to work. This also increases the timber's strength and helps prevent attack by fungi and some wood-boring insects. When felled, the wood's cell cavities and walls contain water, and this moisture content must be reduced to between 6 and 8 per cent. 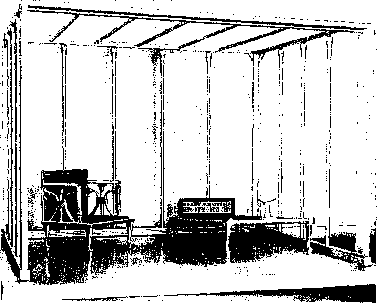 Egyptian carpenters were experienced in estimating the moisture content of timber. They realised that very dry atmospheric conditions would cause timber to dry out even further, resulting in additional splitting and shrinkage after it had been worked into its final form. Along the desert edge changes in atmospheric conditions are limited and this factor has helped to preserve large amounts of furniture. The wet boards would have been rested against the walls of the workshop or stacked in wigwam fashion. It was important that air be allowed to circulate around the timber. The timber would not have been placed in direct sunlight and may have been covered with matting to prevent it from drying out too quickly in the hot dry Theban air, which would have seasoned it within a few months. Timbers are considered to be the medium where art has been given a life. Good quality and timber makes great artwork. This is why artists are truly master craftsman.